Historically, storms & hurricanes coming in from the Gulf have tended to head straight inland on the path of least resistance -- one of the river valleys (Brazos, Guadalupe, Nueces) and dissipate the farther away from the Gulf they got. But Harvey's so slow that it's picking up water from the lower river areas and wetlands near the Gulf, and moving sideways as it picks up moisture on one side or the other; hence its original landfall near Rockport followed by a lateral move NE toward Houston, "feeding" itself all the while. Whereas the "old" (historical) paths were somewhat predictable (going upriver from landfall), allowing evacuation patterns to emanate outward from that path, Harvey has rendered any semblance of predictability unreliable, as it could conceivably go anywhere from its current location; it's not moving fast enough in any particular direction to establish a calculable trajectory. It also might well stay where it is until it eventually peters out -- it's got plenty of water to feed it with Galveston Bay and its associated branches as well as within the lower Brazos area. We'll just have to see what happens over the next 5-7 days! In the past a tropical storm.. Allison if recall stalled out over Houston dumping tons of rain.. So this has happened before.. It will happen again. Update now Louisiana is hit by the Harvey Disaster. For comparison, where I live in Wisconsin, we get about 34 inches of precipitation per year. And southeast Texas just got more than that in a couple days. This flood will make its mark in the geologic record for that area. Interestingly, the projected path of Harvey inland more or less follows the future I-69 alignment at least as far as south-central Arkansas; from there the "eye" is supposed to more or less follow US 79 and then US 49 all the way into the boot of Missouri before petering out. Guess it will follow the infamous "Dickey Split" for much of its travel! But seriously -- when this sort of storm goes inland, watch out for swarms of tornadoes! Update a local TV station is reporting another dead due to Harvey. Best wishes to everybody going through this major disaster. It's going to take years to clean up this mess. This might make Katrina look like an afternoon thundershower. This is a neat photo. It isn't as deep as the water above, but it's churned up by the storm's winds. This is on I-10. Here's the storm total. The scale tops out at 25 inches, but there are reports of more than 50. 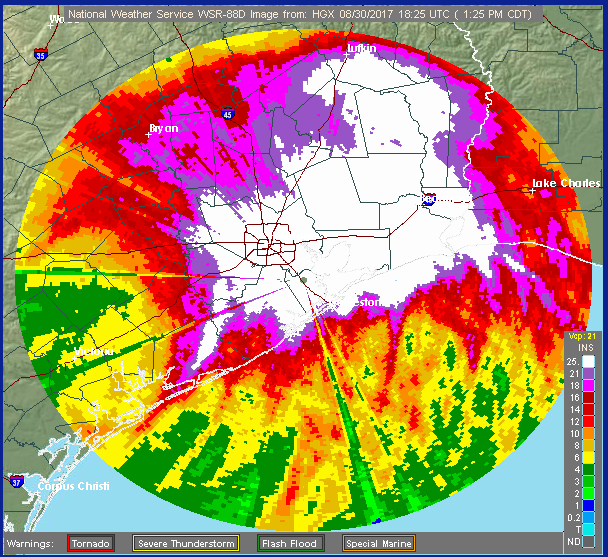 Essentially all of Harris County had more than 25 inches. Galveston, Chambers, Liberty, Hardin, Jefferson, and Orange Counties are entirely covered in white. More than half of Jasper County and just about all of Tyler County are, too. Beyond this, all the way up to Bryan and Lufkin there are 18 inch totals, which in most storms would be extreme. Interestingly, out over the Gulf, where it wouldn't hurt anyone, the totals are much less. I know a little about meteorology, and I can't think of any reason why the heaviest rain would be over land. The outer bands often produce tornadoes over land because of the lower-level winds being impeded, which reduces the Coriolis effect and changes the direction, which introduces shear and can produce horizontal vortex tubes that can be verticalized and stretched by convective currents to form tornadoes. I've never paid to see if tropical storms usually drop more rain over land. This one does seem to have stayed stronger over Texas than a landfallen storm usually does because it was feeding off its own rainfall, what Wikipedia calls the "brown ocean effect." I remember John Hope long ago talking about Danny getting stronger over land as it approached the ocean, and surmising that it was due to this effect. 21 people are found dead so far from Harvey. "Today marks the first step in a journey of many, many steps back towards normalcy in our area after the onslaught of Harvey. In the east, some lingering rain from Harvey`s back edge remains this afternoon. Otherwise, we have no rain, and the sun is beginning to break through from west to east. A lack of rain is an infinitesimal, but more than deserved prize for the large number of dedicated first responders, dispatchers, and volunteers who have put in so many hours of hard work under terrible conditions to help the citizens of Southeast Texas." The link will work temporarily. The archive will move progressively back as new discussions are issued. They're no longer online when they fall off the end of the 50 links. A chemical plant is facing an environmental disaster but that's still being determined here over how much damage Harvey made to the plant. I'm linking to this address because I think it's permanent. A couple of other links look like ones that simply go to the latest advisory. Update Tennessee is under Tornado watch due to the remains of Harvey. This is really neat: aerial photos of the flooding. Who knows what will happen with Irma. Many storms have gotten big out there, yet peter out before they get here, or the make a turn and go north. There's a chance Irma could go into the Caribbean or Gulf, but it's too far out to predict. As of yesterday morning, there was also another low-pressure system located just off the Yucatán in the Gulf that had the potential to become another tropical system that could hit Texas. Ugh. On I-69 just north of the bridge over the West Fork San Jacinto River between BW 8 and SH 99, it looks like the divider is a single piece, and it was bent downstream by the water. It broke at Sorters McClellan Road where presumably the bridge columns held it in place. This is the only visible road damage I've found in the new photographs. I-10 appears to have mud on it at the San Jacinto River. Even if there's no damage, which may not be visible in the photos, that would need to be cleaned off. The only major road that's still flooded that I saw is the Sam Houston Tollway just south of I-10 on the west side. At the time of the photo, 2 lanes on each side of I-10 just below the Addicks were covered, but traffic was moving. They call Hurricane/Tropical storm Harvey the worst natural disaster in US history since... Hurricane Katrina breaks the earth levees to flood New Orleans in Aug 2005...or the San Francisco earthquake/fire in Apr 1906 ... and even the great Chicago Fire of Oct 1871. Flooding in the US' 4th largest city, Houston, was epic - 5 days of endless rain in a prone flood basin. 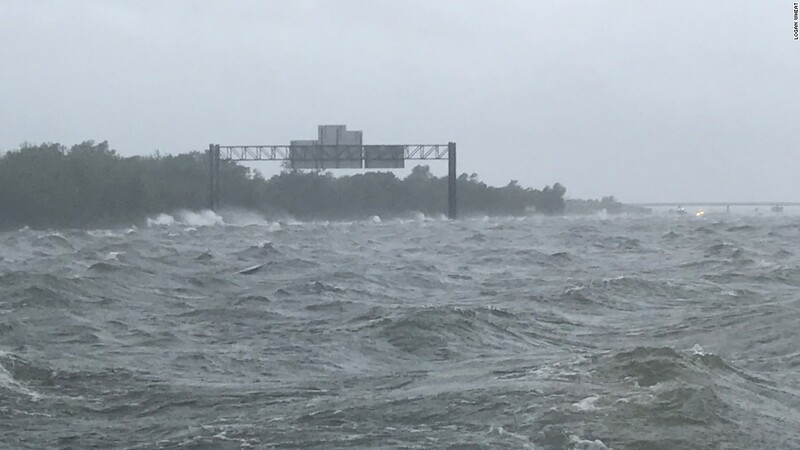 And Louisiana wasn't spared, they recall Rita in Sep. 2005 along the Tex-Lou state line, while Houston is vividly reminded of tropical storm Allison in June 2001.